If you know anything about me, know this: ice cream is my favorite food. Unfortunately, in my journey to becoming healthier (i.e., eating more whole foods and less refined sugar), I've had to cut back significantly on my ice cream intake. 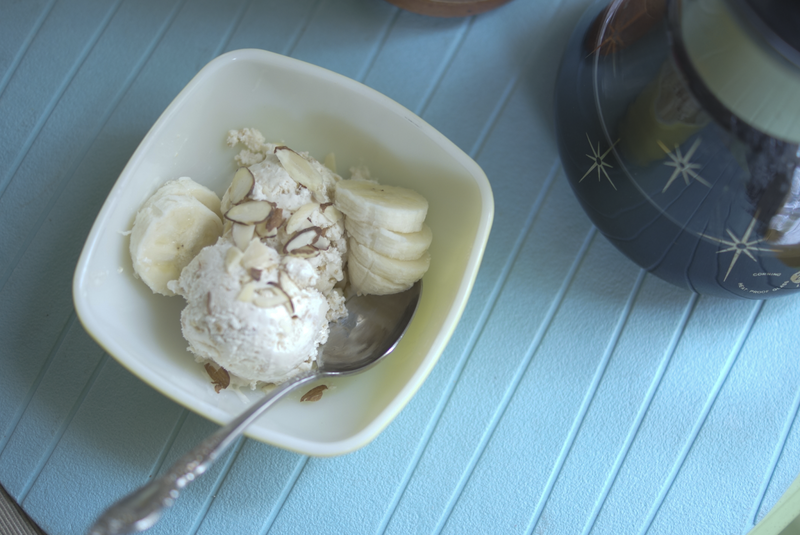 Don't worry about me, though: I got an ice cream maker last month, so I've been perfecting my coconut milk ice cream recipe using natural sweeteners like honey or pure maple syrup. This is all very necessary science in the face of a rapidly approaching summer. Summers before, I've survived on frozen grapes, popsicles, iced coffee, and ice cream. Two summers ago I bought my first popsicle molds and proceeded to experiment with freezing Greek yogurt with berries stuffed in it. "We can eat these for breakfast!" I exclaimed to my sweaty roommates. 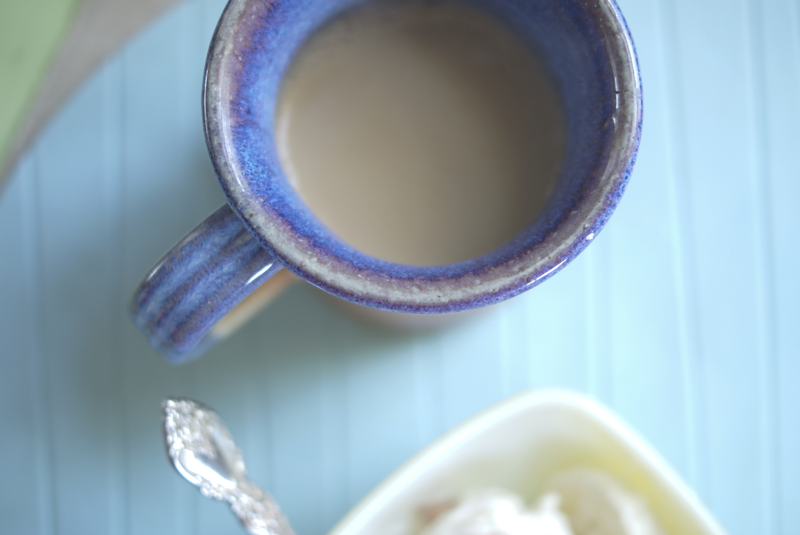 With my new ice cream maker, I decided to take it one step further: breakfast ice cream. OK, so technically it's breakfast frozen yogurt, but you get the idea. Everything in this recipe—including the name—is aimed at the goal of getting myself out of bed and an air conditioned room to go to work this summer. Don't worry about Mike, he has summers off so he can hide out in our room all day long. But I'm going to need to more desperate measures. Full disclosure: It's currently in the 60s outside, so this is all just preparation for a sweltering summer that part of me is hoping will come. If it doesn't, then I'll just eat this because it's delicious rather than to keep my insides from catching on fire. Enough chit chat. Let's get to it. 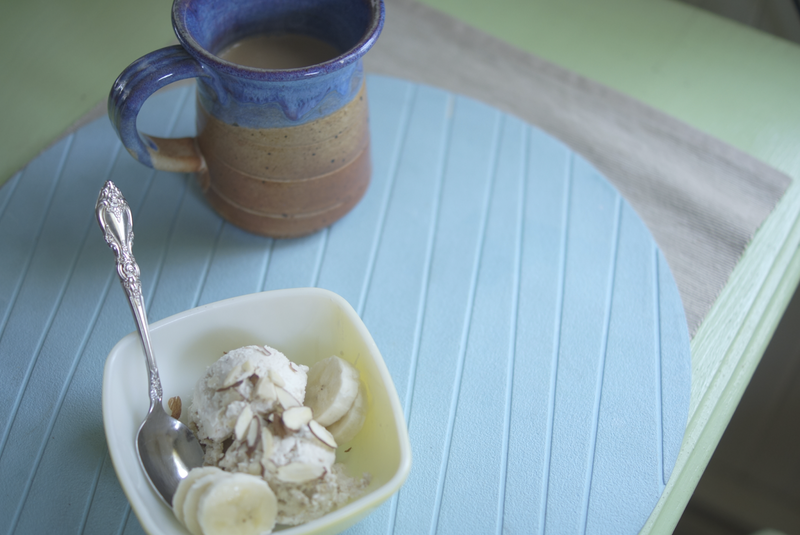 For a simple breakfast ice cream, you'll need Greek yogurt. 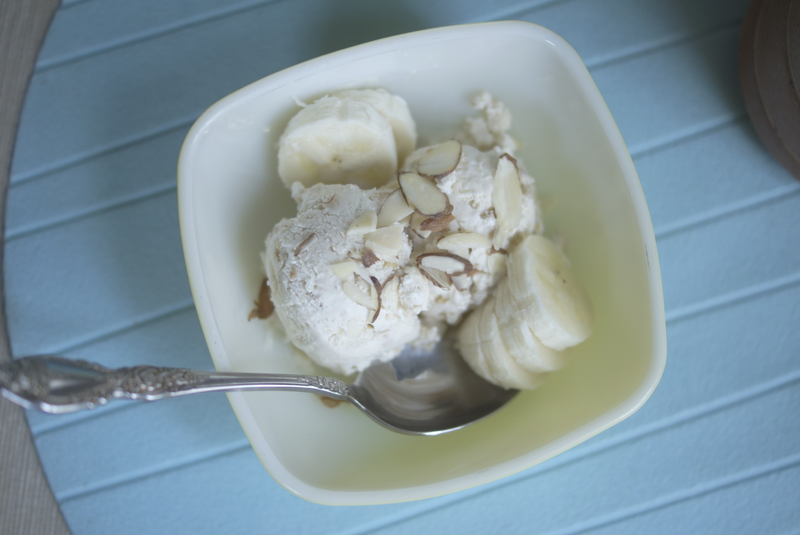 If you like plain Greek yogurt, then go for it! I opted for Trader Joe's (delicious) honey Greek yogurt. 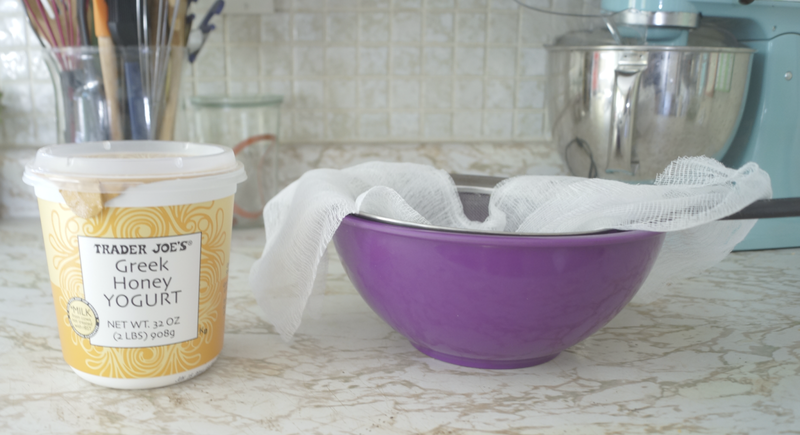 Grab some cheese cloth, a fine strainer, and a bowl. Dump all that yogurt-y goodness in there. Finally! A use for that cheesecloth I bought a lot of months ago! 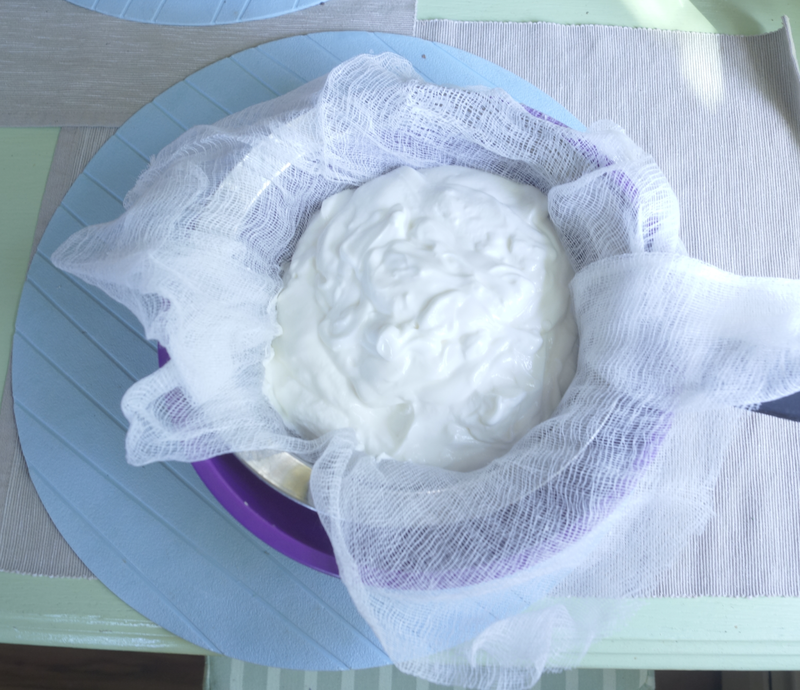 You're probably thinking, Isn't Greek yogurt already strained within an inch of its life? Yes, but there's still a lot of liquid left in that inch, so to be safe, let's just exercise our patience and put our yogurt in a strainer in the fridge for a few hours. You know that mysterious clear liquid that appears at the top of your yogurt a few days after you open it? That's what we're getting rid of. The two pound container of yogurt I bought strained out about 2/3 cup of liquid in the fridge over the course of five hours. Less liquid = less icy breakfast ice cream. 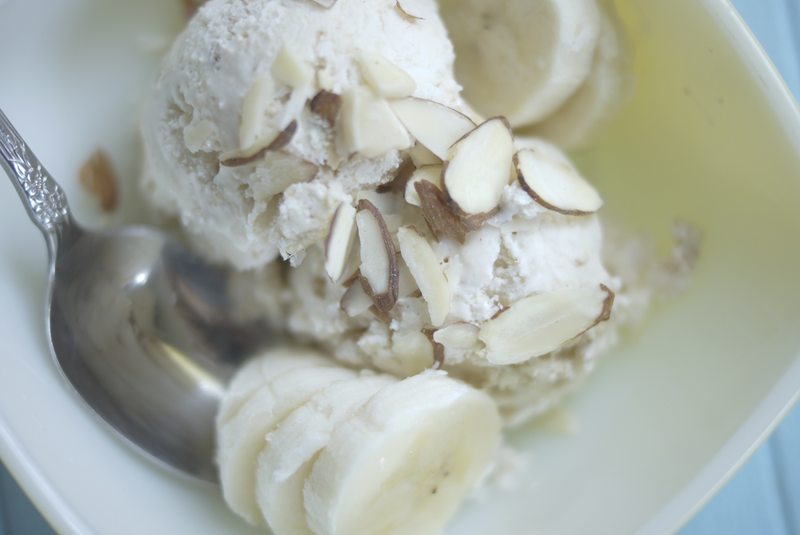 After your yogurt is strained, freeze it in your ice cream maker according to the manufacturer's instructions. It will freeze just like any other ice cream batter, though maybe a little bit faster. Add any mix-ins you want in the last five minutes of freezing. I added peanut butter and granola to mine to complete the breakfast theme. I scooped the frozen yogurt back into its original container and froze it overnight to harden. 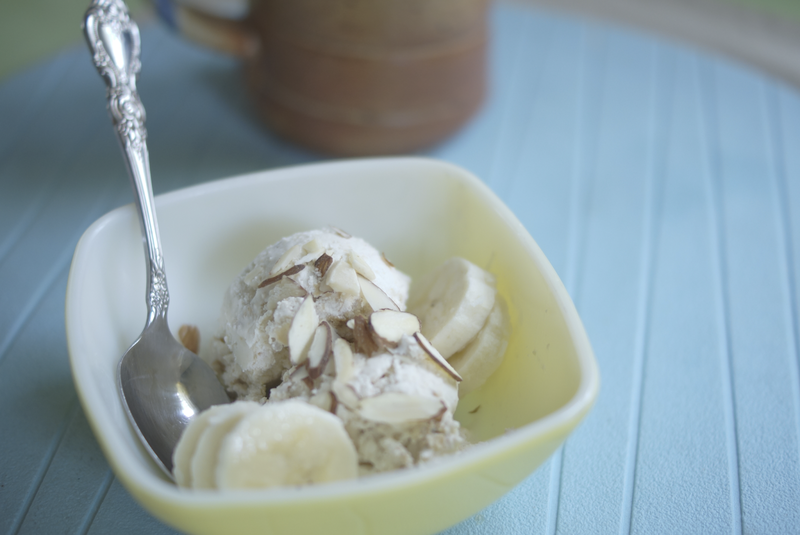 When it came time to eat it, I added slivered almonds and sliced bananas with a side of coffee. Add some fresh pineapple, cherries, banana, cacao nibs, and you have yourself a breakfast banana split! The possibilities are endless here, folks.